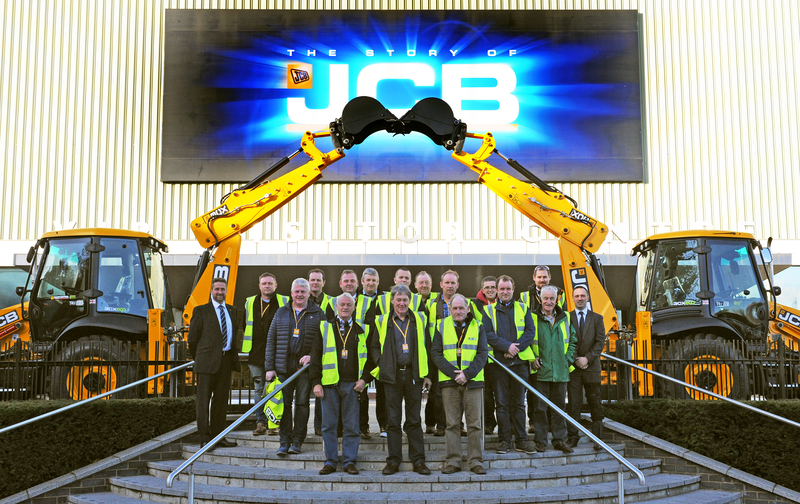 The ECI Cork customers who were on a 2 day VIP visit to see some of the JCB Facilities in the UK this week. 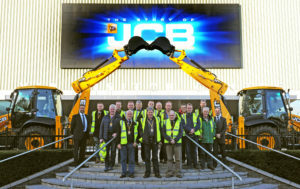 There was a travelling party of 20 people who were initially welcomed into the JCB Theatre at JCB World headquarters before visiting the “Story of JCB” and then going on a tour of the manufacturing facilities from both JCB Backhoe and JCB Loadall as well as the new assembly line for the New range of JCB site dumpers, in the afternoon they were taken to the JCB World Parts centre (WPC) at Waterloo park where they were given a tour of the extensive facility which also houses the JCB Uptime centre which is where the JCB Livelink GPS tracking and machine diagnostics centre is located- and the WPC is also home to JCB Attachments where the huge array of machine add on’s are assembled or manufactured – they then were brought “next door” to the purpose built JCB Heavy Products factory which is dedicated to building all the JCB Tracked and Wheeled excavators from the latest JCB JS110W – the Hydradig right through to the JCB JS520LC – a 52 ton machine -. The following day started with a visit to JCB Power systems which is where JCB employ over 300 people manufacturing the range of JCB Diesel Max engines from Tier 2 for export right through to Tier 4 final which are used on JCB machines across the range up to and including the JCB JS220 excavator as well as 6 cylinder diesel engines for the JCB export market. It was then on to visit the JCB Comact factory which builds all of the JCB range of Mini excavators from 800kg thru to 10 tons as well as the JCB Teletruk and JCB Rough Terrain Forklift range – before yet again hopping inn “next door” to the JCB Earthmover factory where the full range of JCB Industrial and Agricultural wheeled loading shovels, as well as the JCB Fastrac and JCB range of TM telehandlers are also manufactured – so a non-stop – fast paced visit packed into 48 hours!